Paris is undoubtedly an enchanting city: from its unknown corners to its most instagrammable places, the City of Light has a unique atmosphere that you’ll want to bring back home with you. With all those unimaginative souvenir shops around the city, it might be hard to decide what to buy in Paris. Sure you could always go for a beret or some macarons, but that’s not what Paris is about. 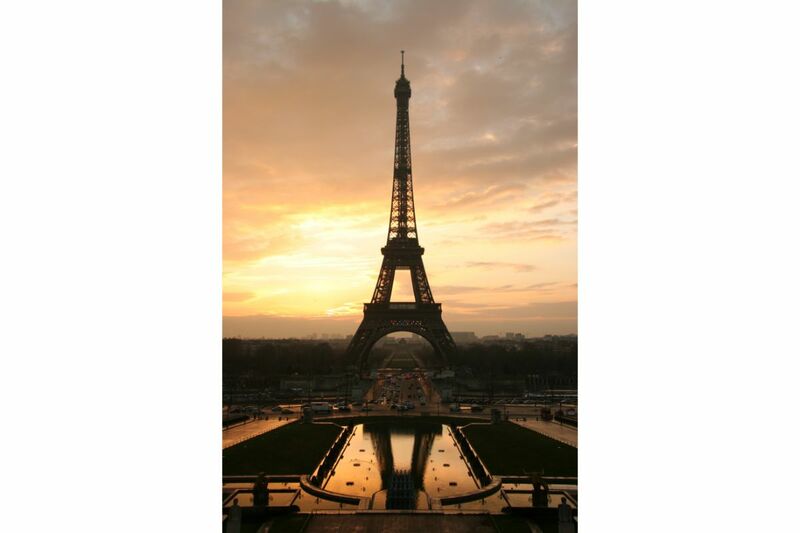 Read on to discover the best ideas about the most original souvenirs to buy in Paris! If you’re not from the EU, you’ll be hard pressed to find this distinctively French cheese. The reason for that is because it’s made of raw milk cheese (which is banned in the US). 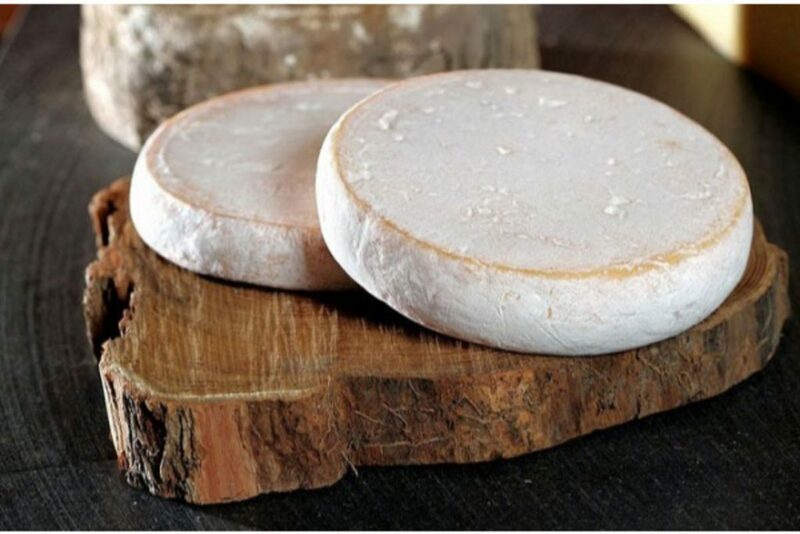 Although it is made in the Alpine region of Savoy, Reblochon can be easily found in supermarkets and cheese shops all around Paris. Just make sure you get some air-tight packaging to protect it while you travel (and save your clothes from the stench). This trendy concept fashion store is located in the busy Boulevard Beaumarchais, just next to the San-Sebastian Metro station. 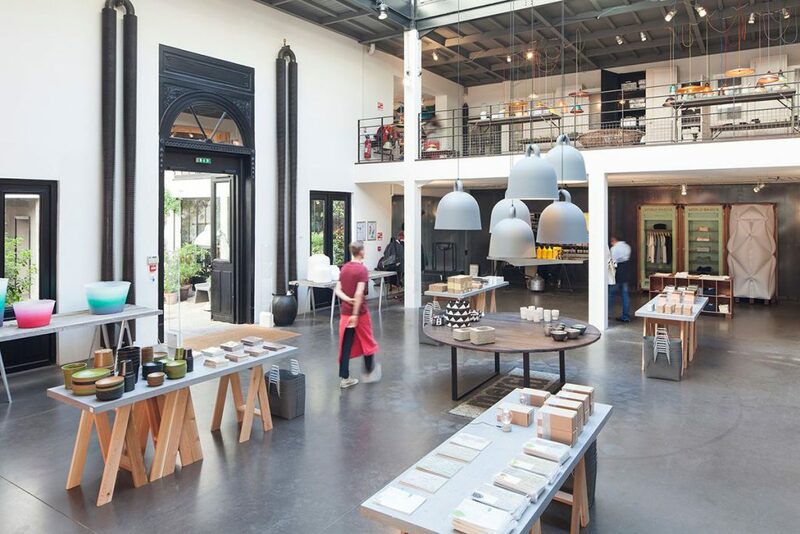 Although it is quite pricey, you’ll definitely find a unique souvenir among their collection of bohemian-style clothing, homeware and stationery. A word of advice: if you do end up buying a mariniere (a classic black and white striped shirt), avoid wearing it in public because you’ll stick out like a sore thumb. Unless of course, you do want to dress like a French stereotype, in which case we suggest getting a baguette and beret to complete the look. 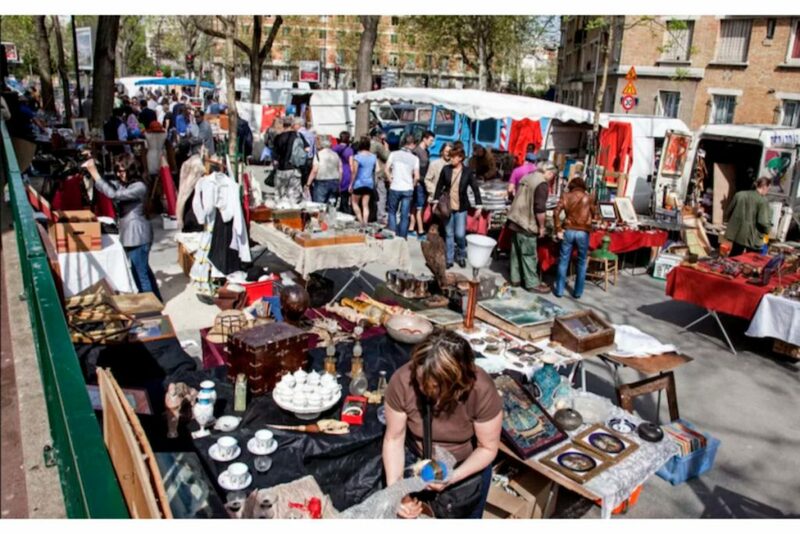 One of the biggest and oldest flea markets in Paris, Marche aux Puces is a paradise for the thrifty traveller. On its stalls, you will find everything from vintage clothes, furniture, antiques and books. If you can haggle a bit, you will leave Paris with lots of exciting souvenirs in your suitcase. Just be careful and keep an eye on your belongings, as the area tends to attract pickpockets. You don’t have to be a millionaire to invest a few euros in a quality champagne bucket! After all, you can use these beautifully decorated ornaments for many other uses apart from lavish parties and formal dinners. 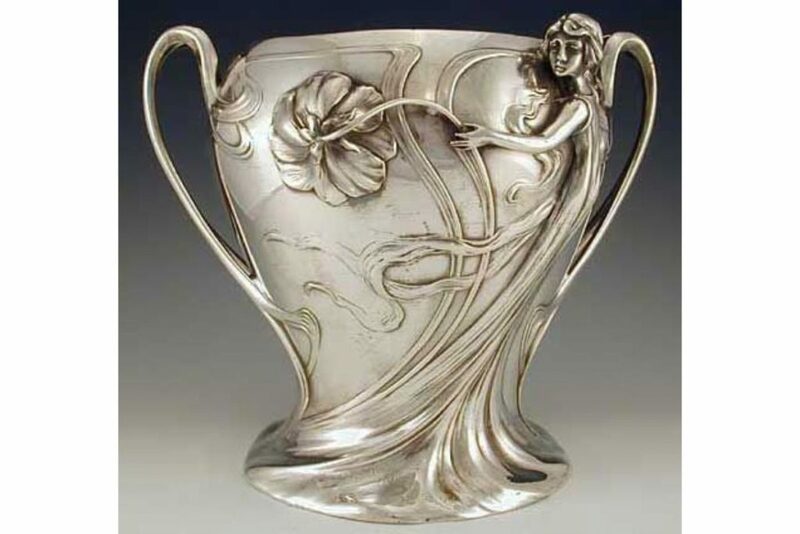 Check out the collection at Christofle when you get the chance! You will find yourself strolling along the banks of the Seine many times while you are in Paris. That’s where you’ll find the Bouquinistes de Paris, sellers of antiquarian and second-hand books who have set up shop along the river. Some of the wares these vendors sell have real historical value, but ultimately, they make for fantastic -and original- souvenirs. 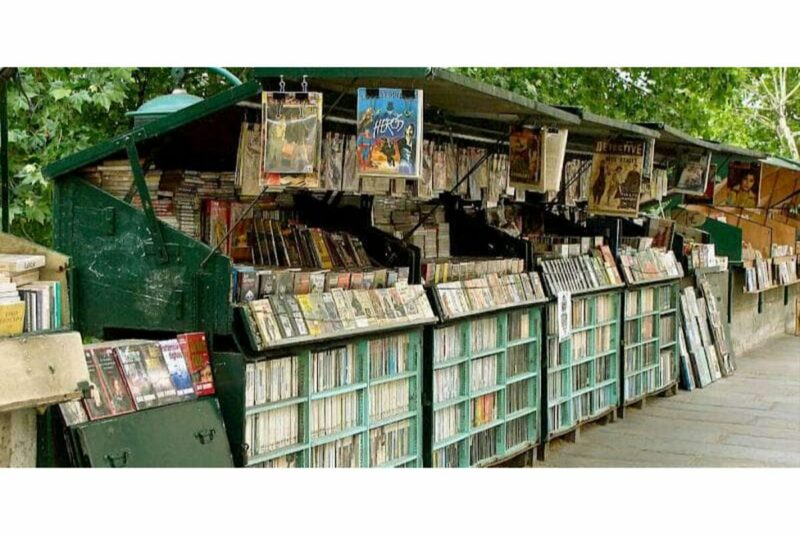 You will find the Bouquinistes in both banks of the Seine (between Pont Marie – Quai du Louvre on the eastern and Quai de la Tournelle – Quai Voltaire on the western side). 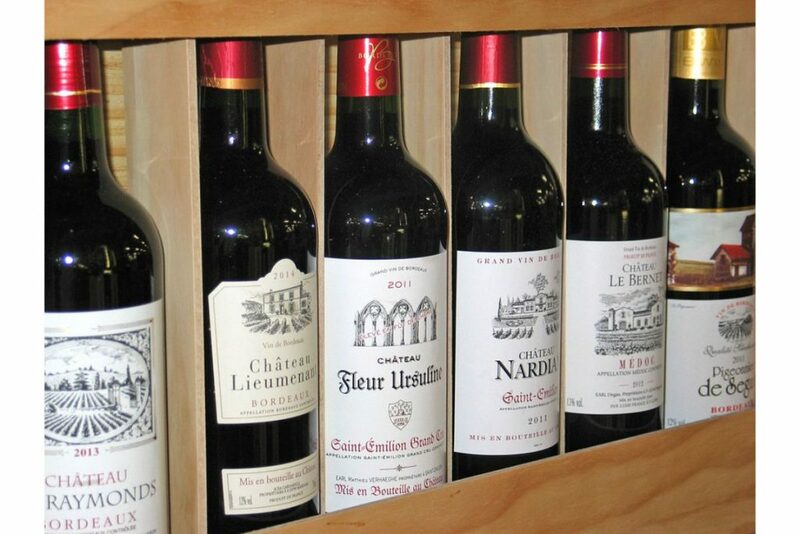 France is known worldwide for its high-quality wineries. And since you’re in Paris, it would be a pity not to bring a few bottles back home with you as a souvenir (assuming you didn’t fly in with a low-cost carrier). The good news is you really can’t go wrong with wine anywhere in this country, so you won’t have to spend a fortune on a good bottle. If you need some insider information, you can visit a caviste (an expert wine shop) and ask the owners for advice according to your budget. Whatever you do, however, avoid buying wine from Montmartre vineyard! 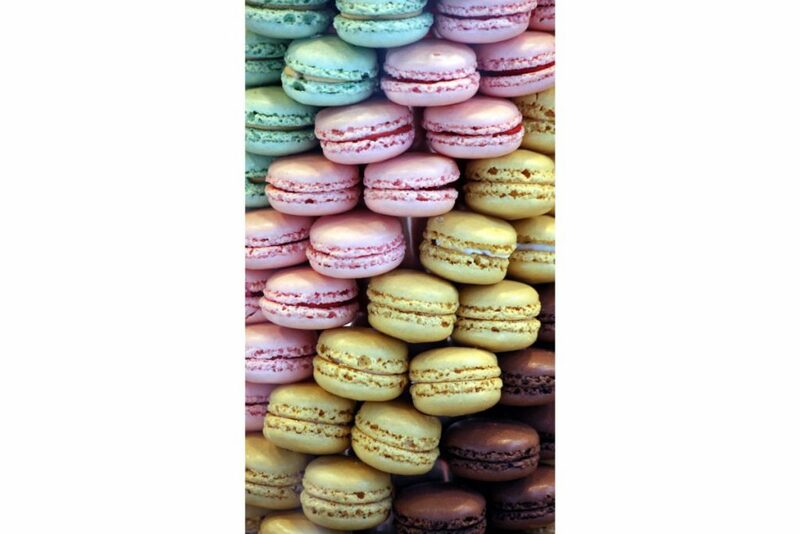 Let’s face it: although macarons are the staple tourist product of Paris, there is a good reason for their popularity. These tiny round cakes with creamy filling come in a broad colour palette and have an addictive taste. Although most guides out there point out Laduree as the best macaron shop, we beg to differ. While it’s certainly not bad, most locals think that they are way overpriced for what they offer. Paris experts inside the Stasher team recommend Pierre Herme as the best place to get your filling of these local delicacies. Le Bon Marche department is also an excellent choice for some decent prices. 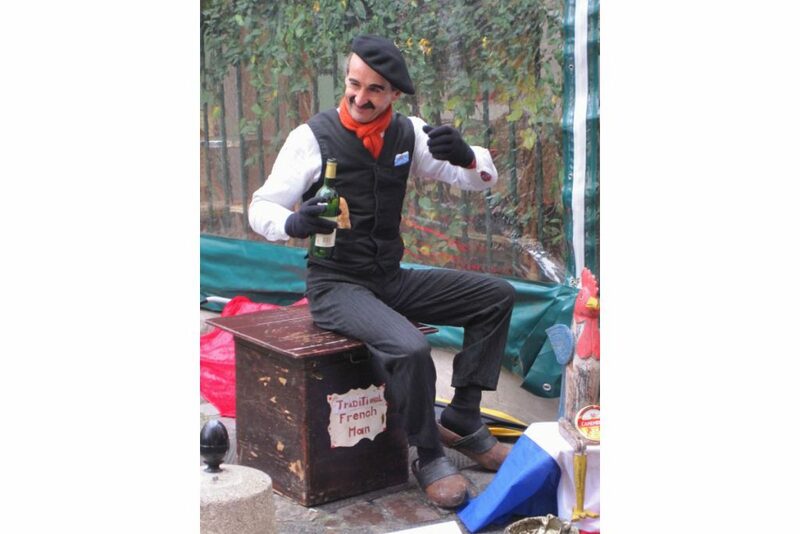 Montmartre was the Mecca of bohemians and urban, artsy types (flaneurs) ever since the 19th century. Its decadent spirit was captured in the immortal paintings of Toulouse Lautrec and scandalous poems of Charles Baudelaire. Although today it is not much more than a touristy neighbourhood, it still oozes with charm, and the artistic vibe certainly lingers on. 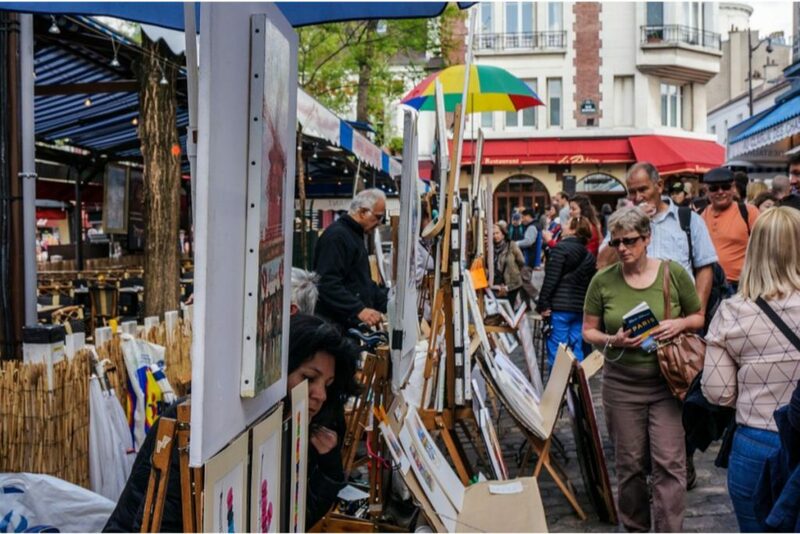 The area’s long tradition is why local painters have set up shop at the Place du Tertre, selling their work to visitors. Buying a piece of their art is a great way to support them and ensure that you’ll get a great souvenir from your Paris visit. Besides cheese, wine and macarons, Paris is also famous for its legendary chocolateries. Some shops, such as Jean-Charles Rochoux have taken their craft to a whole new level with their impressive chocolate sculptures! For some of the best chocolate selections in Paris visit Maison Pralus and try the barre infernale. 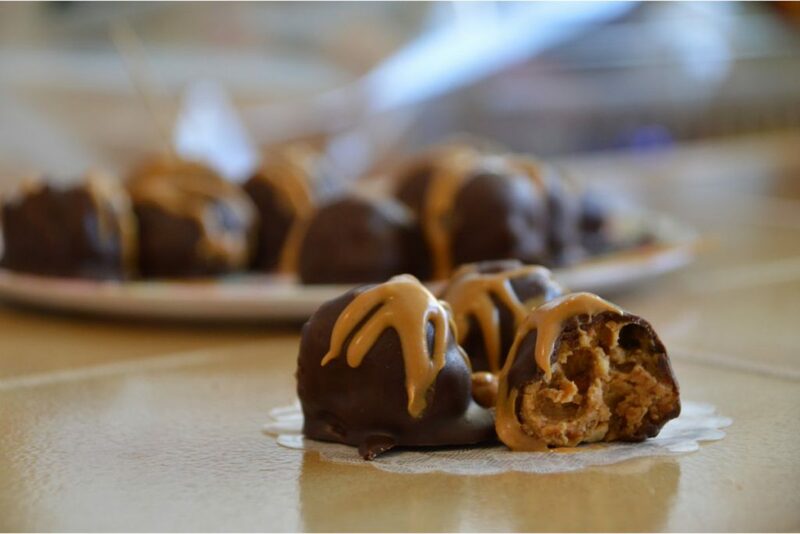 You won’t regret it (well, maybe a bit after you realise how much you actually ate). What would be the most authentic thing to buy in Paris? Ironically, the most popular answers are usually the most touristy cliches. If you want to feel like a local Parisian, visit Monoprix. Essentially a French version of Tesco or Target, there is really nothing fancy about it. Except that its filled with cheap and unique French products that Parisians like: Haribo gummy bears, strangely flavoured chips and an alarmingly wide variety of mustards. If you want the ultimate local experience, give this a try! The truth is, there is nothing less Parisian than the souvenir shops you’ll find all over the city. If you are searching for some last minute gifts to buy from Paris, you’ll have to search quite a bit! So, store your bags in one of our Paris StashPoints and enjoy everything the City of Light has to offer! Hungry for more Parisian content? 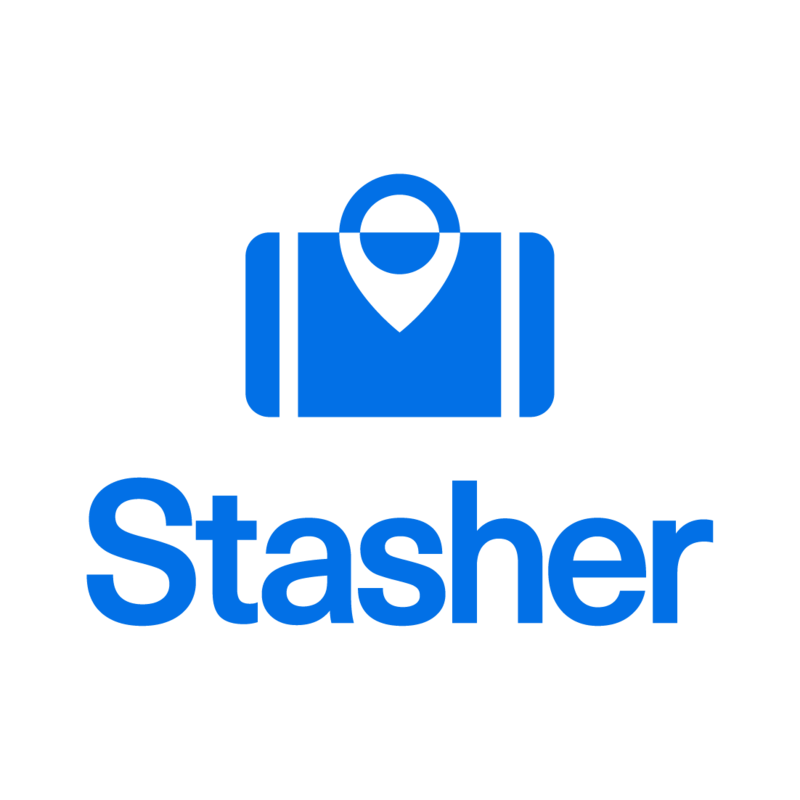 Check out our previous Stasher guides for more travel inspiration!